Our favorite time traveler is celebrating a 50th birthday this year — which makes it a perfect time to think about all the times the Doctor has filled us with awe or whimsy. Here are our 50 favorite "Doctor-ish" moments from the first 50 years of Doctor Who on television. What do we mean by "Doctor-ish"? It's sort of a "know it when you see it" thing, but basically it's moments where the Doctor seems especially other-worldly, able to see things other people cannot, or just especially wonderful. This isn't a list of especially quotable bits, and many of the Doctor's most famous snappy one-liners are not on it, on purpose. Alas, we haven't included any moments from other media, including the Big Finish adventures, comics or novels — but feel free to bring up your favorites that we missed below! 1. His speech in the very first episode about being "wanderers in the fourth dimension." — "An Unearthly Child"
2. The speech about the birth of a solar system, which the TARDIS is about to be caught up in, "atoms are rushing towards each other... until minute little collections of matter are created." — "The Edge of Destruction"
3. The final line of the show's first season: "Our destiny is in the stars. So let's go and search for it." — "The Reign of Terror"
4. His farewell speech to Susan: "One day, I shall come back... until then, there must be no regrets, no tears, no anxieties. Just go forward in all your beliefs, and prove to me that I am not mistaken in mine." — "The Dalek Invasion of Earth"
5. Musing about how Steven can't possibly understand the perils of changing history, because "we're all too small to realize its final pattern." — "The Massacre"
6. Speaking about regeneration: "Part of me, part of the TARDIS. Without it, I couldn't survive." Plus the 500-year diary — "Power of the Daleks"
7. On evil: "There are some corners of the universe that have bred the most terrible things... They must be fought." — "The Moonbase"
8. Talking to Victoria about his lost family: most of the time they "sleep in my mind and I forget... Our lives are different to anybody else's." — "Tomb of the Cybermen"
9. Explaining to the Time Lords why he's chosen to go out and fight evil, instead of staying at home and watching. — "The War Games"
10. Explaining to Jo Grant the mysteries of time: "Every choice we make changes the history of the world." — "Day of the Daleks"
11. Telling Jo Grant about his experiences with meditation on Gallifrey, in which the pathetic drifts of snow were suddenly "shining white" and a tiny flower became "the daisiest daisy." Also, the bit where he says that "wisdom is to seek the truth" — "The Time Monster"
12. Telling Codal that courage is about "being afraid, and doing what you have to do anyway." — "Planet of the Daleks"
13. His first adventure with Sarah Jane. "Are you serious?" "About what I do, yes. But not necessarily the way I do it." — "The Time Warrior"
14. Almost his last words: "I got lost in the time vortex. The TARDIS brought me home." — "Planet of the Spiders"
15. "There's no point in being grown up if you can't be childish sometime" — "Robot"
16. His big speech about the human race, who are "puny defenseless bipeds" but "indomitable," waiting to wake up and conquer the stars — "The Ark In Space"
17. Contemplating his lonely journey: "I'm a Time Lord. I walk in eternity." — "The Pyramids of Mars"
18. "Travel broadens the mind" — talking to Sarah Jane, on her last adventure. — "The Hand of Fear"
19. His utter horror at the Captain's mass murder on a multi-planetary scale: "You commit mass destruction and murder on a scale that's almost inconceivable, and you ask me to appreciate it?" — "The Pirate Planet"
20. To Romana: "You and I exist in a special relationship to time... perpetual outsiders" —- "The City of Death"
21. Teaching Adric about the joys of non-linear storytelling: "Anybody can make sense." — "The Keeper of Traken"
22. Going to speak to his own future self on the bridge, and then coming back shrouded in forboding. — "Logopolis"
23. Lecturing the Cybermen about small pleasures, like smelling a flower or eating a well-prepared meal. — "Earthshock"
24. Reflecting on his past, falling apart: "A man is the sum of his memories. A Time Lord even more so." — "The Five Doctors"
25. Contemplating all the destruction he leaves in his wake, and how it drives his loved ones away: "It seems I must mend my ways." — "Resurrection of the Daleks"
26. His speech as he crashes the spaceship into Androzani Minor, explaining that he got Peri into this, and he owes it to her to get her out, and he's dying anyway, and "I'm not going to let you stop me now!" — "The Caves of Androzani"
27. The bit where he rigs up a teleportation device using a relaxation booth and a wristwatch, and then rubs his little lapel cat for luck. That always gets me. — "The Twin Dilemma"
28. The wonderful scene where he talks to the shopkeeper about whether his decision to put sugar in his tea could change the universe: "Every great decision creates ripples." — "Remembrance of the Daleks"
29. To the Brigadier: "You were supposed to die in bed." — "Battlefield"
30. The bit where he talks about evil from the dawn of the universe: "Time is born, matter, space. The universe cries out like a newborn." — "Curse of Fenric"
31. His final speech to Ace: "There are worlds out there where the sky is burning, and the sea's asleep... We've got work to do." — "Survival." 32. That bit where he puts on his new shoes and dances around and talks about remembering his childhood on Gallifrey: "A meteor storm. The sky above us was dancing with lights. Purple, green, brilliant yellow." - "The Enemy Within"
34. The "gravity" speech: "The entire planet is hurtling around the sun at 67,000 miles an hour, and I can feel it. We're fallin' through space, you and me, clinging to the skin of this tiny little world, and if we let go... That's who I am." — "Rose"
35. The holographic farewell to Rose: "Have a fantastic life." — "The Parting of the Ways"
36. His speech about planet Earth and its wonders, ending with: "It is defended!" — "The Christmas Invasion"
37. "You can spend the rest of your life with me, but I can't spend the rest of mine with you. I have to live on. Alone." — "School Reunion"
38. "People assume that time is a static progression... it's more like a big ball of wibbly-wobbly, timey-wimey stuff." — "Blink"
39. The moment where he puts the Family of Blood into their eternal prisons, with a look of cold fury on his face. — "The Family of Blood"
40. "All my love to long ago" — "Time Crash"
41. "You look like giants to me." — "The End of Time"
42. The bit where Amy is floating outside the TARDIS, with the Doctor anchoring her. — The Beast Below. 43. "The way I see it, every life is a pile of good things and bad things. The good things don't always soften the bad things, but vice versa, the bad things don't necessarily spoil the good things or make them unimportant." — "Vincent and the Doctor"
44. Explaining Rory's resurrection: "The universe is very big... sometimes, very rarely, impossible things just happen, and we call them miracles." — "The Pandorica Opens"
46. The Doctor telling Idris that he thought the TARDIS was the most beautiful thing he'd ever seen. — "The Doctor's Wife"
47. Saying that time "has never laid a glove on me!" and then hearing about the Brigadier's death. — "The Wedding of River Song"
48. Explaining his wanderlust: "I am not running away from things. I am running to things." — "The Power of Three"
49. Ripping out the last page of the book and saying "I hate endings" — "The Angels Take Manhattan"
50. 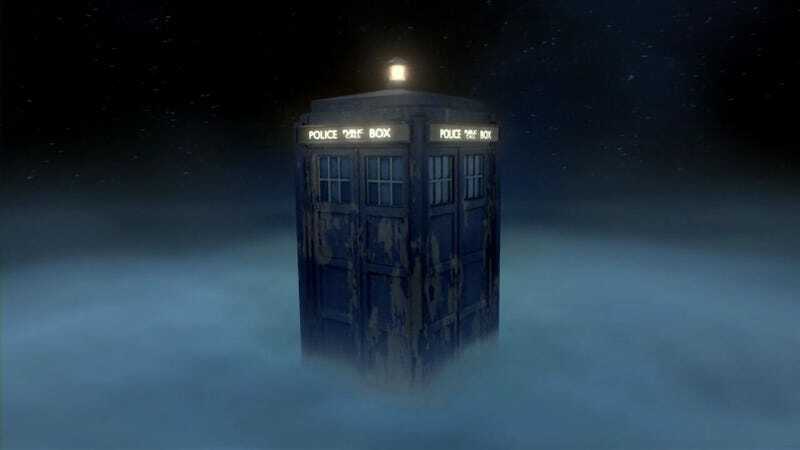 The TARDIS perched up on a cloud, with the Doctor hiding away from the world in "The Snowmen"